We’d love your help. 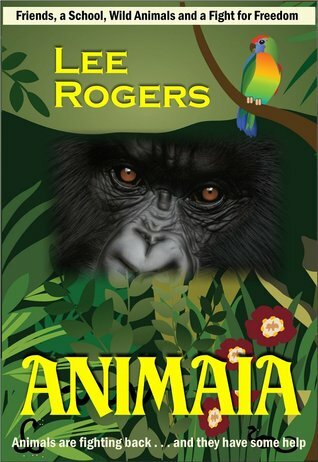 Let us know what’s wrong with this preview of Animaia by Lee Rogers. In the exotic country of ANIMAIA, Arno Steele and his school friends battle to save their animal-friendly world from those determined to destroy it. Jungles, beaches, wild animals, dinosaurs, and a very mysterious school with equally odd teachers come together in this young adult fantasy of 101,000 words. Mild sci-fi and paranormal elements, and some challenging themes. Suitable for 12 years to adult. Book one in a series. The story is complete and stands alone. Arno Steele can talk to animals – and he’s very, very good – as his dad discovers when Arno is four. A young Arno is infatuated with the legend of the Truemore, an historical saviour who will one day return to protect his mystical and animal-friendly world, Animaia (anim-eye-a), from destruction. The modern country of Animaia arose from The Great Animal War of Liberation over 100 years ago and remains under constant threat of returning to the “old ways.” An elite few have inherited an ancient ability to talk to animals telepathically and they are called “Anima.” The Anima are trained as the protectors and administrators of human-animal integration in the society. At thirteen, Arno is to be packed off to an elite school for young Anima. As events unfold, a reluctant Arno is perceived by some as the new saviour. Too bad: Arno would rather stay at home and hang out at the beach with his school friends, Leroy, Ashley and Charlotte, and his lifelong buddy Arkie the crow. What’s a boy with such exceptional ability and a possible foretold destiny to do? But now dark forces are gathering once more, and they are organised like never before under the influence of a leader who believes it is his divine destiny to destroy the free-living Animaian state and create a realm of unbridled exploitation and destruction. Animaia fears "the return of the fleshers." Arno is under personal threat, and he and his friends find themselves at the centre of this threatening storm at their Anima school, wondering if they can unleash the mystical Truemore -- the human form of the spirit of life itself -- to help in the battle for their homeland, or if the Truemore is nothing more than legend and folk lore. To ask other readers questions about Animaia, please sign up. a good book! i'm a fan of animals and this one really shows that we should take care of animals... the setting of the story is somewhat familiar with those who can also talk to animals.. this story is well-written and the characters(as well as the animals) are really fascinating and wonderful..even though the story is somewhat similar..the author manage to give it a twist to lure readers to its depths..nice work! ANIMAIA - (Book 1). In the alternative, exotic country of ANIMAIA, Arno Steele and his animal-talking school friends battle to save their animal-friendly world from those determined to destroy it. Jungles, beaches, wild animals, dinosaurs, and a very mysterious school with equally odd teachers come together in this young adult fantasy of 101,000 words. Mild sci-fi and paranormal elements, some challenging themes. Suitable for 12 years to adult. Book one in a series, but the story is complete and stands alone. Ultimately, Arno must face the leader of these destructive forces when a school camp in the jungle goes wrong and he finds himself fighting for his life. This book contains a very new concept for a story: certain people talk with animals by means of special telekinesis powers. This power sets them apart from the majority of the citizens who don’t have this power. As always, the different guy becomes the heart or the hero of the story and in this case so it is with Arno. Not everyone in his birthplace can talk to animals and of those who do, most can only talk to one type of animal, maybe two, but in this story Arno, talks to many animals. That is This book contains a very new concept for a story: certain people talk with animals by means of special telekinesis powers. This power sets them apart from the majority of the citizens who don’t have this power. As always, the different guy becomes the heart or the hero of the story and in this case so it is with Arno. Not everyone in his birthplace can talk to animals and of those who do, most can only talk to one type of animal, maybe two, but in this story Arno, talks to many animals. That is unheard of, and Arno doesn’t want anyone to know that he can. Yet the cat comes out of the bag when he saves his best friend from being eaten by a giant boa. Some bystanders use their phones to pass videos of the miraculous event along. Now things are changing in his life, even the head of the elite training school takes a personal interest in him. What is going to happen with his friends and football when he enters the prestigious academy? This doesn’t matter to his parents who both want him in that school. He, however, isn’t quite sure he wants to pursue this gift. Arnos soon finds out that school isn’t as bad as he thought; he even gets to have his friends there. All is peachy until he discovers that there is a mysterious plot brewing on his world, and this can mean only one thing—problems between human and animals. Animaia is a great read, although it feels a bit slow at times. More dialogue would resolve that problem. It is interesting. I found no editing problems in it. It could be very well received by teen of all ages and adults alike. Author Rogers imagines a world where some humans can communicate with other life form through thoughts. A group of teenagers ends up in Anima, DIPI, where they are expected to develop and use their talents to protect animals from poachers and other bad individuals. The action moves along as they encounter different creatures and situations. This short tale will appeal to young adults with an interest in wildlife and conservation. It was a really good story especially if you are an animal lover. I really loved the story line and the 4 main characters are also amusing and lovable. The pacing and the writing itself was also very good. However, it seems to be a similar to Harry Potter, only animal style. DIPI sounds like Hogwarts. Arno is like Harry, Leroy is Ron. A lot of potential for this series. I'm excited to read the next one. A very entertaining read! I could compare this book to having a similar feel to either the Harry Potter or Percy Jackson books, but I believe this book is more enjoyable for me as it has an inspiring message with it in regards to ecology and animal rights. By the end of the book, I found myself wanting to re-read the story and also anticipating the followup book. Great - I'm the author!